One Less Nemesis Blog: 299 One Less Spartan Now Available! Check it out! We listened to your feedback from the Drawing Board and from our facebook page. 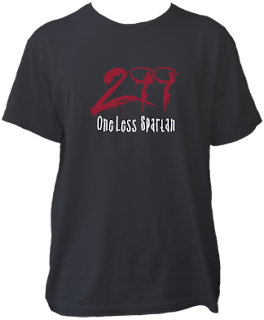 By popular demand, 299 One Less Spartan is now available for purchase! Plus, from today through Friday, June 26, we're offering it at $3.00 off. Don't forget to check out all of our designs, because when you order more than one shirt, you get free shipping!